I will be forever grateful to Tiffany over at Creme de la Crumb for posting this amazingly delicious chicken recipe. Sorry my picture is a little blurry above, but I had already tasted one and was so keen to get on and eat more that I didn’t want to waste time trying to get the perfect picture. Tiffany created this recipe in an attempt to replicate the Sticky Fingers served at Wingers restaurants. I’ve never been to a Wingers, we don’t have them in the UK, so I can’t say whether these are like those but what I can say is that if I was served these in a restaurant I would be a very happy girl. 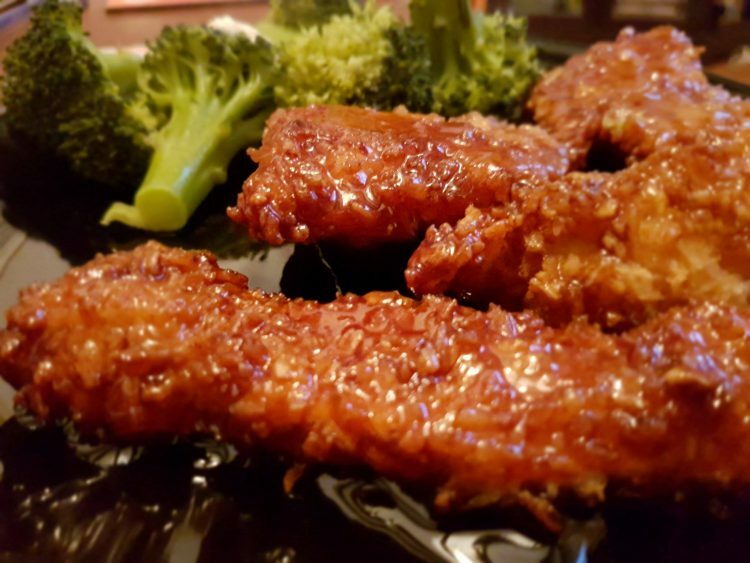 They are crispy (and stay crispy even when coated in the sauce), and sticky, and hot from the chilli sauce, and I shall definitely be making them again (I hope I’m not over-selling them here). The original recipe also called for some garlic powder, but I didn’t add that; partly because I didn’t have any, and partly because I felt this hot sauce was flavorsome enough. A dressing or sauce to dip them in. I meant to buy ranch dressing, but I accidentally bought caesar dressing instead, but hey, that worked too! Or blue cheese dressing would be good too. Something that has a little bit of tang to it to contrast with the hot and sweet of the chicken. 1. Preheat oven to 220C/425F and grease a baking sheet with spray cooking oil. 2. Slice chicken breasts into strips (about 3 – 4 strips per breast depending on size). Add chicken strips and flour to a large ziplock bag. Seal and toss around until chicken is well coated in flour. 3. Tip panko crumbs in a bowl. 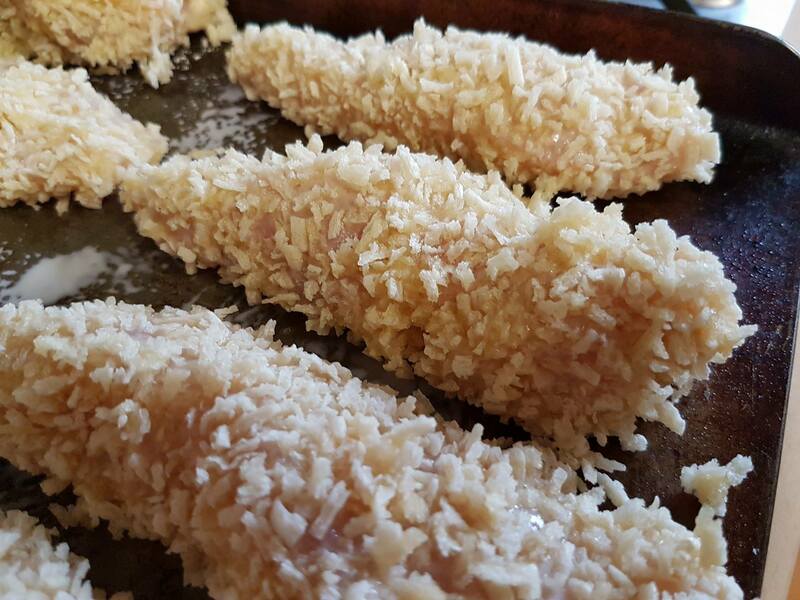 Dip flour-coated chicken strips first into the beaten egg and water mixture, and then into the panko crumbs to coat on all sides. 4. Place the chicken pieces on to the baking sheet. 5. Spray well with more cooking oil. Bake 15-20 minutes until chicken is browned and cooked through. 6. Make the sauce while chicken is cooking. Add the brown sugar and hot sauce to a pan and stir over medium-high heat until melted, bring gently to the boil then stir in the water. The sauce needs to be hot to serve, so if you’ve completed this before the chicken is ready, just rewarm it gently. 7. When chicken strips are done cooking, toss them in sauce till covered all over and serve immediately with your dipping sauce/dressing of choice.